There have been recent advances in paediatric cardiac imaging including new technologies in echocardiography (echo), cardiac magnetic resonance (CMR) and 3D cardiac printed models. Anatomy – Real-time 3D imaging is particularly helpful in assessing the mechanism of valvular abnormalities or the relationship of a ventricular septal defect to inflow or outflow tracts. The main objective of 3D imaging is to gain a better understanding of intracardiac anatomy and to assist with surgical planning. 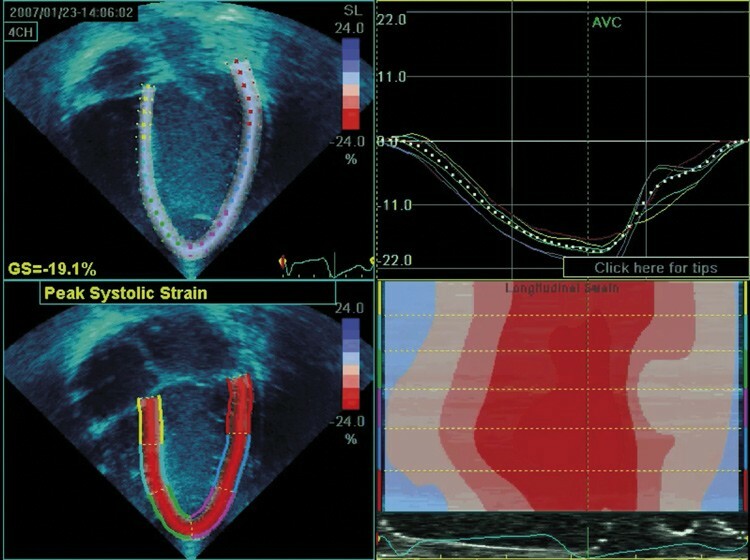 Function – Speckle-tracking derived strain is a new modality that has gained interest in assessing systolic function. It uses speckles or pixels to track myocardial thickening and shortening during the cardiac cycle. 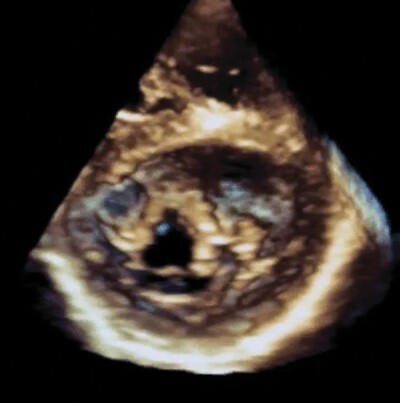 It is a sensitive measure of subclinical systolic dysfunction and can detect regional abnormalities. Early signs of systolic dysfunction have been found in patients with Duchenne muscular dystrophy or childhood cancer survivors, despite having a normal ejection fraction (the usual method of assessing systolic function). This suggests that strain analysis may have a role in detecting early ventricular dysfunction during long-term cardiac surveillance. Handheld devices – Smaller and more compact handheld echo devices, such as the GE VScanTM, can offer diagnostic cardiac imaging. These devices are easy to use and non-cardiologists can be trained to perform studies. We see a potential role for implementing handheld echo in rural WA communities by local clinicians to provide screening, early detection and surveillance of rheumatic heart disease (RHD). Ultimately we hope this will overcome barriers to service provision in remote communities to improve detection rates of RHD. Anatomy, function and flow – CMR is considered the gold standard in assessing ventricular function and provides a wealth of information including blood flow volumes, volumetry and global and regional function. It is generally favoured over CT when functional information is useful, or if a large field of view is needed such as screening in systemic vasculitis as there is no radiation exposure. Myocardial characteristics – Myocardial viability assessment is one of the many strengths of CMR, including using real-time perfusion sequences to assess for ischaemia, and late gadolinium enhancement to define myocardial fibrosis and scarring. 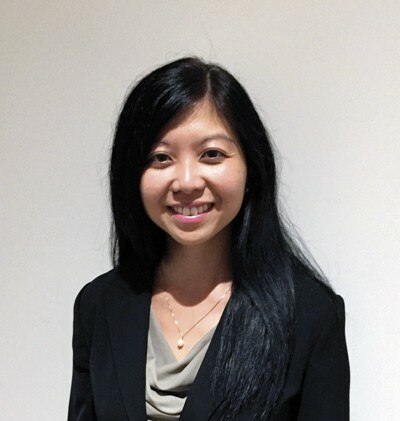 A new technique called T1 mapping can directly quantify diffuse fibrosis and provides important information on tissue characterisation. 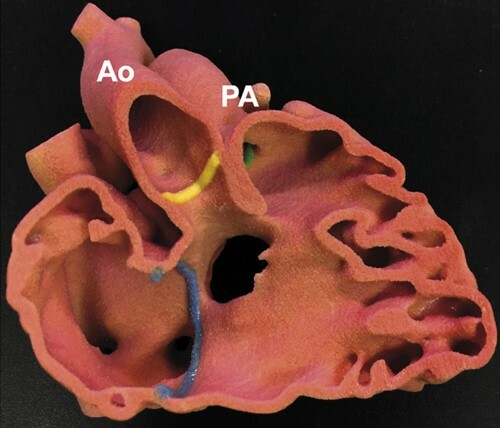 3D echocardiogram of a mitral valve cleft, 3D model of double outlet right ventricle (DORV) from the RV side, showing the relationship of the ventricular septal defect to the aorta (Ao) and pulmonary artery (PA). Applications – 3D printed models derived from CMR or CT datasets are a useful adjunct to echo and cross-sectional imaging in pre-operative surgical planning of complex cardiac cases. It is also possible for the surgeon to perform surgical simulation on different complex hearts, providing extremely valuable practical skills plus it is an excellent educational resource in better understanding intracardiac anatomy.